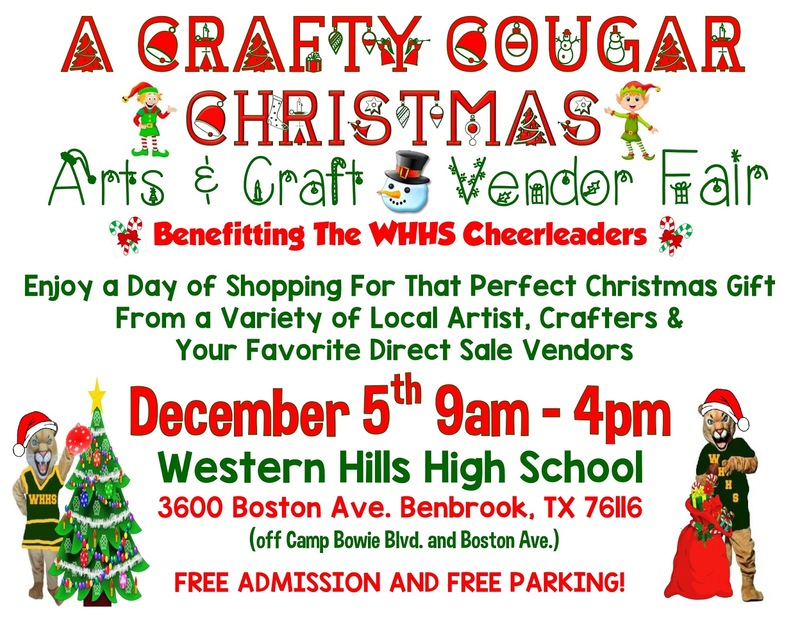 "Western Hills High School Cheerleaders are hosting the A Crafty Cougar Christmas Arts & Craft Show / Vendor Event on Saturday, December 5, 2015 from 9:00am to 4:00 pm. Admission and Parking are free. This is an all-day event that features a variety of Handmade Items and your favorite Direct Sales Vendors along with several Food Vendors. We will have Santa, and our mascots Cujo & Cassie there for a perfect Christmas Picture and Raffle through out the day! 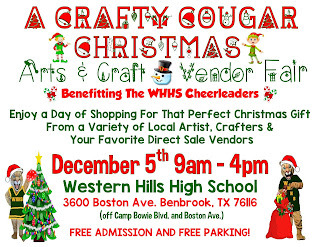 All proceeds benefit the Cheerleaders and Mascots of Western Hills High School. So make sure to mark your calendars and bring the whole family to enjoy a day of shopping, yummy food and lots of fun for everyone!" Booths are 10x10 for $35.00 plus raffle item. Electricity is additional $10.00. Applications are available here and are due by November 30, 2015. For more information, visit their website or contact their event coordinator at whhscheerleaders@gmail.com.